How the Art of Attack book is helping me. The classic bishop sacrifice at last!!! One of those things that I've always wanted to do. Ever since I've read the art of attack, I've always wanted to do the classical bishop sacrifice. I've tried it a few weeks ago, but my opponent was able to withstand it and I lost on a piece down ending. I kept thinking I'll just do it again next time, but the opportunity never came again. The position wherein the classical bishop sacrifice appears is rare so it seems. Although actually, in here the position does not actually conforms to the 'ideal' as there is one element missing - A forward pawn on the e-file.. But I couldn't help myself. What kind of a sacrificer am I if I don't accept the challenge of such situations? Aha!! I will offer this sacrifice in honor of Nezhmetdinov. The game itself was a procession of botched chances and missed opportunities. 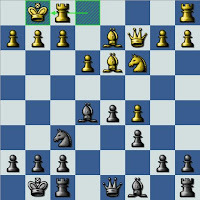 I did manage to win in the end, but it was really - how shall I say it.. 'not solid'.. it required the assistance of my opponent to get the win. I could've kicked myself.. I failed to find some strong moves.. moves that could have ended it earlier and would have made the win that much more satisfying.. the blindness again.. it rears its ugly head. But the good thing is I am seeing the moves I've missed and who knows, maybe next time my attacking technique would be stronger..
Nimzo was right, defense is part of the game. Nice bishop sacriface but i am not sure that it's winning the game if white doesn't help like he did in the game. Nevertheless you dared to play Nxh2+ so kudos to you for courage. Make that Bxh2+ instead of Nxh2+ in my previous comment.